Rookie group B1A4 will be making their Japanese debut in January next year. On November 11th, WM Entertainment revealed that B1A4 will release a licensed version of their album in Japan on January 25th of next year. 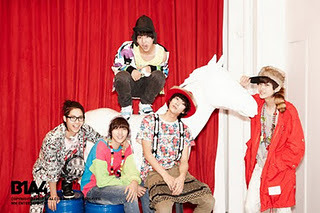 The album will feature their Korean hit singles including debut track "Ok" and their latest release "Beautiful Target". The agency stated, "The boys are currently preparing for their first showcase "B1A4 - JAPAN SHOWCASE LIVE 2011" which will take place at the Stellar Ball in the Shinagawa Prince Hotel in Tokyo, Japan on December 9th." They continued, "B1A4 are perfecting their choreography and songs as well as studying Japanese." Recently, B1A4 signed an exclusive contract with one of the biggest Japanese agency "Pony Canyon" which a subsidiary of Japanese Media Group "Fujisankei Communications Group". Comprised of members Baro, Sandeul, Jinyoung, Gongchan and CNU, B1A4 made their debut last April with single "OK", and now currently promoting their comeback hit single "Beautiful Target".